Jean´Toots´ Thielemans (1922 - 2016) was born in Brussels, Belgium. He immigrated to the USA in 1952. At the age of three he could already play the accordion and started playing harmonica as a hobby. Toots was `hooked´ on Jazz during German occupation and his first big idol was Django Reinhardt. Thielemans once started his career as a guitar player. In 1949 he joined a jam session in Paris with Sidney Bechet, Charlie Parker, Miles Davis, Max Roach and others. It all started there: after tje jam session in Paris he participated in European tours with Benny Goodman, making his first record in Paris with fellow band member, tenor saxophonist Zoot Sims. A year later he became a band member of the singer-songwriter and compatriot Bobbejaan Schoepen (at the time still as a guitarist). He moved to the US where he was a member of Charlie Parker's All-Stars and worked with Miles Davis and Dinah Washington. He played and recorded with Ella Fitzgerald, Jaco Pastorius, Peggy Lee, The George Shearing Quintet, Quincy Jones, Oscar Peterson, Bill Evans, Paul Simon, Billy Joel, The Happenings, Astrud Gilberto, Shirley Horn, Elis Regina and others. 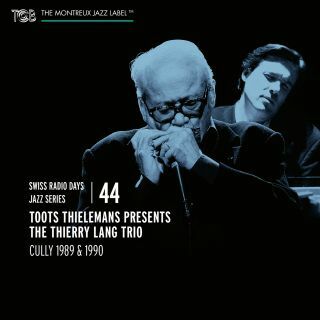 A jazz standard composed by Toots Thielemans is "Bluesette" where he used whistling and guitar in unison. It was first recorded by Toots, now 50 years ago, with lyrics added by Norman Gimbel the song became a major worldwide hit. His harmonica playing can also be heard in film scores such as Midnight Cowboy, Jean de Florette, Sugarland Express, The Yakuza, Turkish Delight, The Getaway, French Kiss, Dunderklumpen, and in various TV programs, including Sesame Street, the Belgian TV series Witse, and the Dutch TV series Baantjer. He composed the music for the 1974 Swedish film Dunderklumpen! in which he also voiced the animated character Pellegnillot. His whistling and harmonica playing can be heard on Old Spice radio and TV commercials that have been made over the years. During the 80's Toots performed with bassist and composer/bandleader Jaco Pastorius in ensembles ranging from duet to the Word of Mouth Big Band. In the early 80's he contributed to Billy Joel's album An Innocent Man, and his trademark harmonica can be heard on "Leave a Tender Moment Alone." A year later, he appeared on the Julian Lennon song "Too Late For Goodbyes" from the album Valotte. In 1984, he recorded the final album of Billy Eckstine (I Am A Singer), featuring very beautiful ballads and standards arranged and conducted by Angelo DiPippo. The 90's Thielemans embarked on theme projects that included world music. In 1998 he released a French flavoured album titled "Chez Toots" that included the Les Moulins De Mon Coeur (The Mills of my Heart) featuring guest singer Johnny Mathis. Apart from his popularity as an accomplished musician, he is well liked for his modesty and kind demeanor. In his native Belgium, he is also popular for describing himself as a Brussels "ket", which means "street kid" in old Brussels slang. He received a joint honorary doctorate from the Université Libre de Bruxelles and the Vrije Universiteit Brussel (Belgium) and in 2001 Thielemans was ennobled a baron by King Albert II of Belgium. In 2005 he was nominated for the title of The Greatest Belgian. In the Flemish version he ended 20th place, in the Walloon version he ended 44th place. In October 2008, he was honored with the 2009 National Endowment for the Arts Jazz Masters Fellowship. On 23 January 2009, he joined Philip Catherine on stage at the Liberchies church (Belgium) in memory of the 100th anniversary of Django Reinhardt's birth.